Well, there’s really not a whole lot to say about this product! It either works, or it doesn’t. I’m pleased to report that it does! There’s no worry of accidentally opening up the lower condom section when you press the button to open up the upper compact/mirror portion. In fact, releasing the catch for the condom section is a slight bit tricky till you do it a few times. 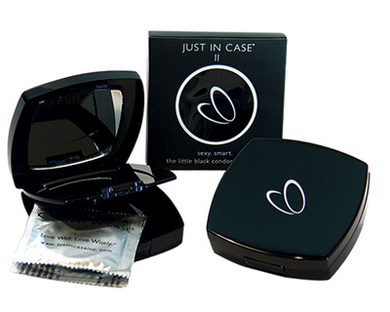 The compact is pretty, simple shiny black plastic with a non-descript logo design on the top. Easily mistaken for a make-up compact in your bag. It comes with 2 condoms and that’s about all it’ll hold. It would hold more if you get ones that have slimmer packaging, I guess. Why should you have something like this? It’s simple – the foil packaging for condoms is nowhere near indestructible. Especially in the average woman’s handbag there’s going to be a sharp object which could puncture a rogue condom. Sextoy.com carries a bunch of different types of condom cases if this isn’t your style. There’s little zippered pouches from FYN, French Leather Envelope styles for the men or the women who don’t carry handbags, plain hard plastic cases that are unisex, and even pretty “condom cubes” that can sit slyly on your bedside table without alerting most people to their contents.